Now that your land has titled, it's time get the exciting construction journey started. 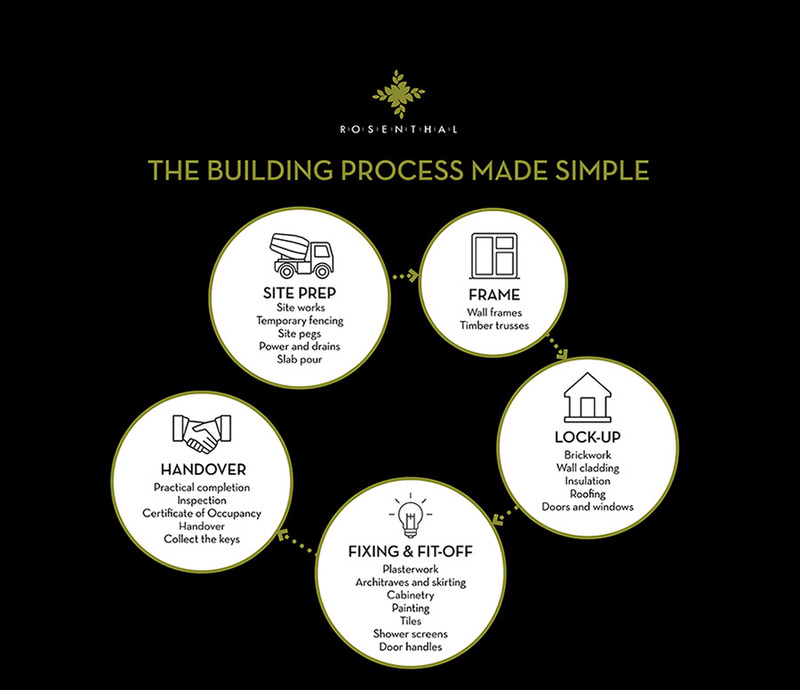 Here's the building process outlined in 5 easy-to-understand steps, so you know what to expect with the road ahead. After many months of visiting display homes and collecting ideas, you've found your dream home design, chosen a block, signed a HIA building contract and are ready for construction to begin! Here's the building process outlined in 5 easy steps, so you know the road ahead. Once your block of land has been titled it is officially ready to build on. Your builder will start to prepare your block to get it ready to have the slab laid, which can mean the installation of temporary fencing and an excavator to create a level base. Your home footprint is positioned, according to your site plan, and marked with pegs in readiness for your slab to be poured. Underground power and drainage is also installed during this stage and once your home slab has been poured, you are well on the way to being in your new home. As the carpenters put the wall frames and timber trusses in place, your new home really starts to take shape. You can begin to visualise what life in your new home will look like and make plans for new furniture and decor. The lock up stage is quite significant as the external components are all installed such as brickwork, wall cladding, insulation and roofing, and with doors and windows, your home is now part of your new neighbourhood and is officially secure. Now it's time for the inside of your new home to be the focus, during the fixing stage. Internal plasterwork is completed along with architraves and skirting boards, and your kitchen and bathroom cabinetry is all put in place. The walls are painted with your chosen colour schemes, tiles are laid, mirrors, showerscreens and door handles are all finished. The final stage of the building process involves a certified building surveyor inspecting your new home and issuing a Certificate of Occupancy. Your new home is ready to move into, grab the keys, book the removalist and plan your house warming party!